The Lexus RX is the only vehicle to have had a zero driver death rate for six years in IIHS studies. 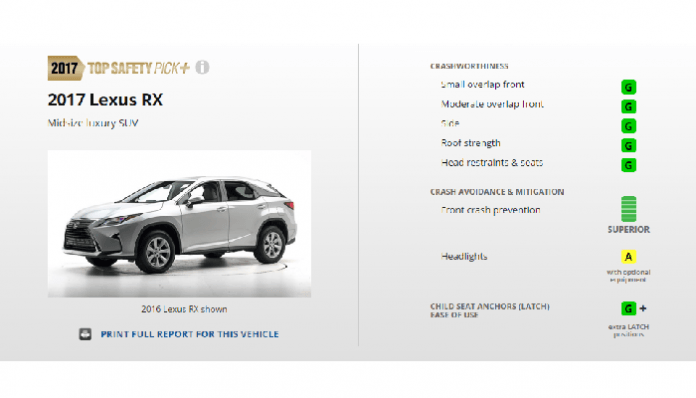 The Insurance Institute for Highway Safety has just released its most recent study and the Lexus RX crossover has again proven itself the safest vehicle in America. The study looks at real-world accident reports from police departments to determine the driver death rate of each U.S. model. The Lexus RX has a zero driver death rate in this new report. It is also the only model to have had a zero driver death rate in the previous report from three years ago. In the prior report, it was the all-wheel-drive Lexus RX that scored zero driver deaths. This time it is the RX 2WD trim that has that low rate. The AWD trim has a rating of 2 driver deaths per million registered vehicle years. Only 21 vehicles have a score lower than 8 on this list. Toyota’s Tacoma 4WD Long Bed and CT200h also scored zero on the driver death rate list. Toyota/Lexus again have the most vehicles with zero driver deaths in America, but this time Audi/VW ties Toyota Lexus with three as well.